Tacori’s lacy, delicate style of craftsmanship is a signature feature of its diamond engagement rings. If you would like to sell a Tacori engagement ring, our quick and secure sales process will ensure you receive the highest possible cash offer. Tacori has been making jewelry in the United States since the 1970s. They were one of the pioneers of the “modern vintage” look that dominated bridal jewelry in the late ‘90s. Tacori’s use of filigree, hand-milgraining, and engraving (along with ornate patterns of metalwork) made their engagement rings popular among the Hollywood newlywed set. Being based in California, they were able to capture the L.A. market and expanded their distribution worldwide through their retail partnerships and robust advertising campaigns. When selling an engagement ring by Tacori, a lot depends on which collection the design is from. While some designs are fairly simple and can sell to a wider audience, there are also many designs (especially the older ones from the late 90’s up to around 2005) that are very ornate and may have a very specific audience, making them harder to sell on the second-hand market. Today’s trend has gone the way of simplicity, and the basket look and complicated Art Deco “architecture” style remakes have become sort of extinct and replaced by today’s sleek and tailored look. The new Crescent designs still seems to be selling well. Another thing to note about Tacori’s lacy, delicate “architecture” style of craftsmanship is that while it is beautiful, it doesn’t always hold up over time. When a craftsman does a lot of filing, piercing, and sawing by hand into a ring it tends to lose some of its structural strength. If the ring is very well taken care of and not used for doing things like yardwork, dishes, etc. it will probably be fine, but a heavily used ring may begin to bend and twist over time. Because of this, a jewelry buyer like Diamond Estate will have to look at every Tacori ring individually and evaluate it on a case by case basis. Overall, Tacori is a successful brand with a lot of fine handwork put into each piece, so there is some added value which will carry over into the second-hand market more than a generic piece, but it won’t bring as much as the likes of Tiffany, Cartier, Harry Winston, or Graff. When selling a Tacori engagement ring, the majority of the value will be in the center diamond. Since Tacori is a well-distributed and advertised brand, the original purchase price will definitely have carried a premium. At the point of resale, you can expect to recover more than a generic brand but still expect to get a fraction of the original retail price paid for the ring alone. However, you may be able to get a nice payoff on the center diamond. If you would like to sell a Tacori engagement ring, contact Diamond Estate Jewelry Buyers today. We will be happy to provide a free consultation and quotation. I sold a diamond engagement ring and a wedding ring. Paula was exceptional to work with. She answered all of my questions and assuaged any concerns that I had. I know the price I got read more was fair, as I had a prior gemologist look at the rings, but I was not comfortable dealing with that outfit for reasons other than the price. I am comfortable with my decision to sell, and I know I got the best offer I could get at this time. I highly recommend Diamond Estate Jewelry Buyers. Thank you, Paula, for all the time you spent with me. You have immense patience and empathy. The people at Diamond Estate Jewelry Buyers were professional and courteous and offered a good price for my engagement ring. I wasn’t sure I wanted to ship off my ring so I researched read more the company as much as I could until I was satisfied. Sure enough, their business with me matched up to the reputation I saw online. I highly recommend them. I sold a diamond engagement ring and a wedding ring. Paula was exceptional to work with. She answered all of my questions and assuaged any concerns that I had. I know the price I got read more was fair, as I had a prior gemologist look at the rings, but I was not comfortable dealing with that outfit for reasons other than the price. Tacori was founded in 1969 by Haig Tacorian, who left Europe and settled in Glendale, California. Together with his wife Gilda, they began creating fine jewelry that combines the essence of California’s style with old world European traditions. Tacori’s early work focused on pearls, but their designs expanded into diamonds by the early 1990s. The design process at Tacori begins, as many jewelry designers do, with artist’s sketches. But these sketches are then transformed into three-dimensional models using a Computer Aided Design (CAD) program. After the models are perfected, three-dimensional molds are created, and pieces are then cast from the molds. Craftsmen then add the finishing touches by hand, including any milgraining or engraving work, stone setting, and final polishing. The end result is a contemporary blend of modern design with old world elegance. Tacori is also known for its signature “crescent silhouette” design. Defined by interlocking half-moon arcs, the crescent design features diamonds placed within each semi-circle. 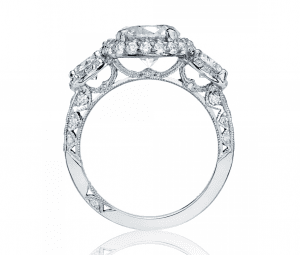 The arcs themselves provide windows of light that highlight the brilliance of the individual diamonds. How Quickly Can I Sell My Tacori Engagement Ring? If you would like to sell your Tacori engagement ring to Diamond Estate Jewelry Buyers, the average time until you have cash in hand is around 4 days from the moment you called us or sent us a message. The exact time depends on a variety of factors, including whether you sell your item to us in person or take advantage of our “sell from home” service. But when all is said and done, and you accept our final cash offer, we will pay you immediately. 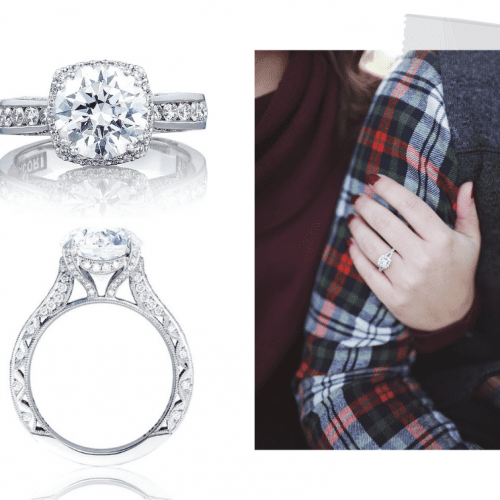 Get the process started now by telling us about the Tacori diamond ring that you wish to sell. 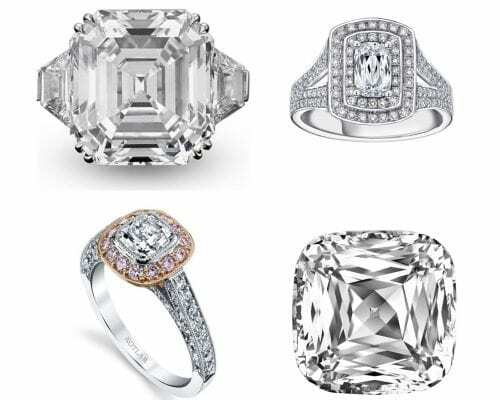 Diamond Estate Jewelry Buyers specializes in purchasing Tacori engagement rings set with diamonds over 2 carats, including items from the following collections: Classic Crescent, Petite Crescent, Dantela, RoyalT, Coastal Crescent, and more.